Romeo and Juliet is a 1968 British-Italian romantic drama film based on the play of the same name, written 1591–1595 by famed English playwright / author William Shakespeare (1564–1616). One summer morning in Verona, Veneto, a longstanding feud between the Montague and the Capulet clans breaks out in a street brawl. The brawl is broken up by the Prince, who warns both families that any future violence between them will result in harsh consequences. That night, two teenagers of the two families — Romeo and Juliet — meet at a Capulet masked ball and become deeply infatuated. Later, Romeo stumbles into the secluded garden under Juliet's bedroom balcony and the two exchange impassioned pledges. They are secretly married the next day by Romeo's confessor and father figure, Friar Laurence, with the assistance of Juliet's nurse. That afternoon, Juliet's first cousin Tybalt, furious that Romeo had attended his family's ball, insults him and challenges him to a brawl. Romeo regards Tybalt as family and he refuses to fight him, which leads Romeo's best friend, Mercutio, to fight Tybalt instead. Despite Romeo's efforts to stop the fight, Tybalt badly wounds Mercutio, who curses both the Montague and Capulet houses before dying. Enraged over his friend's death, Romeo retaliates by fighting Tybalt and killing him. Romeo is subsequently punished by the Prince with banishment from Verona, with the threat of death if he ever returns. Romeo, however, sees his banishment as worse than the death penalty, as Verona is the only home he has known and he does not want to be separated from Juliet. Friar Laurence eventually convinces Romeo that he is very lucky and that he should be more thankful for what he has. Romeo then secretly spends his wedding night together with Juliet and the couple consummate their marriage before Romeo flees. Juliet's father and mother, unaware of their daughter's secret marriage, have arranged for Juliet to marry wealthy Count Paris. Juliet pleads with her parents to postpone the marriage, but they refuse and threaten to disown her. Juliet seeks out Friar Laurence for help, hoping to escape her arranged marriage to Paris and remain faithful to Romeo. At Friar Laurence's behest, she reconciles with her parents and agrees to their wishes. On the night before the wedding, Juliet consumes a potion prepared by Friar Laurence intended to make her appear dead for forty-two hours. Friar Laurence plans to inform Romeo of the hoax so that Romeo can meet Juliet after her burial and escape with her when she recovers from her swoon, so he sends Friar John to give Romeo a letter describing the plan. However, when Balthasar, Romeo's servant, sees Juliet being buried under the impression that she is dead, he goes to tell Romeo and reaches him before Friar John. In despair, Romeo goes to Juliet's tomb and kills himself by drinking poison. Soon afterwards, Friar Laurence arrives as Juliet awakens. Despite his attempts to persuade her to flee from the crypt, Juliet refuses to leave Romeo, and once the Friar flees, kills herself by piercing her abdomen with his dagger. Later, the two families attend their joint funeral and are chastised by the Prince. The director engaged in a worldwide search for unknown teenage actors to play the parts of the two lovers. 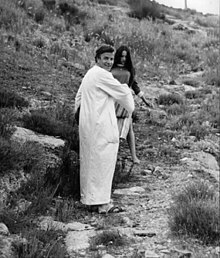 Leonard Whiting was 17 at the time, and Olivia Hussey was 16, and Zeffirelli adapted the play in such a way as to play to their strengths and hide their weaknesses: for instance, long speeches were trimmed, and he emphasized reaction shots. Laurence Olivier's involvement in the production was by happenstance. He was in Rome to film The Shoes of the Fisherman and visited the studio where Romeo and Juliet was being shot. He asked Zeffirelli if there was anything he could do, and was given the Prologue to read, then ended up dubbing the voice of Lord Montague as well as other assorted roles. The balcony scene: At the Palazzo Borghese, built by Cardinal Scipione Borghese in the 16th century, in Artena, 40 km southeast of Rome. The interior church scenes: At a Romanesque church named St. Pietro Somaldi in, Lucca, Tuscania, Tuscania, 90 km northwest of Rome. The tomb scene: Also in Tuscania. The palace of the Capulets' scenes: At Palazzo Piccolomini, built between 1459–62 by Pope Pius II, in the city of Pienza, in Siena province. The dueling scenes with swords were set in the old Umbrian town of Gubbio. The film also has some scenes filmed in Montagnana. The street scenes: Also in Pienza, and on Cinecitta Studios back lot, Rome. 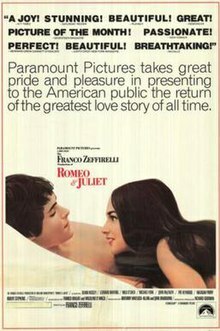 Famous film critic Roger Ebert (1942-2013), for the Chicago Sun-Times has written: "I believe Franco Zeffirelli's Romeo and Juliet is the most exciting film of Shakespeare ever made". Review aggregator website Rotten Tomatoes gives the film a 'Fresh' score of 94% based on 36 reviews, with an average rating of 7.9/10; it is accompanied by the consensus: "The solid leads and arresting visuals make a case for Zeffirelli's Romeo and Juliet as the definitive cinematic adaptation of the play.". Other accolades for Romeo and Juliet included the David di Donatello and National Board of Review awards for Best Director for Zeffirelli, as well as appearing on the National Board of Review's Top Ten Films list for 1968. Two releases of the score of the film, composed by Nino Rota, have been made. "Love Theme from Romeo and Juliet" The film's love theme was widely disseminated, notably in "Our Tune", a segment of the British Broadcasting Corporation (BBC)'s disc jockey Simon Bates's radio show. In addition, various versions of the theme have been recorded and released, including a highly successful one by Henry Mancini, whose instrumental rendition was a Number One success in the United States during June 1969. There are two different sets of English lyrics to the song. The film's version is called "What Is a Youth? ", featuring lyrics by Eugene Walter, and sung by Glen Weston. This version has been released on the complete score/soundtrack release. An alternate version, called "A Time for Us", featuring lyrics by Larry Kusik and Eddie Snyder. This version has been recorded by Johnny Mathis and Andy Williams, among others. Josh Groban performed "Un Giorno Per Noi", an Italian version of "A Time for Us". Jonathan Antoine, classically trained tenor from Great Britain, performed "Un Giorno Per Noi" as one of the tracks on his second solo album, "Believe", which was released in August 2016. A third version is called "Ai Giochi Addio", featuring lyrics by Elsa Morante, and has been performed by opera singers such as Luciano Pavarotti and Natasha Marsh. Thom Yorke cites the film as one of the inspirations for the Radiohead song "Exit Music (For a Film)", which was written specifically for the ending credits of the 1996 film William Shakespeare's Romeo + Juliet. Said Yorke, "I saw the Zeffirelli version when I was 13, and I cried my eyes out, because I couldn't understand why the morning after they shagged, they didn't just run away. The song is written for two people who should run away before all the bad stuff starts. A personal song." Kevin and Paul go to see the film in the episode "Wayne on Wheels" in season three of The Wonder Years. Celine Dion referenced this film, in particular the "hand dance" scene, in the video for her 1992 single "Nothing Broken but My Heart". Japanese manga artist Rumiko Takahashi referenced the Zeffirelli film in two of her manga and anime works. In one episode of Urusei Yatsura, devious troublemaker Ryoko Mendou invites the series' male protagonist, Ataru Moroboshi, to have a "Romeo and Juliet" rendezvous with her, and wears a dress based on Hussey's from the film. Later, Takahashi's Ranma 1/2 featured a storyline in which the lead characters, Ranma Saotome and Akane Tendo, are cast as Romeo and Juliet in a production of the play at their high school. Takahashi designed Ranma and Akane's costumes for the play with Whiting and Hussey's outfits in the Zeffirelli film in mind. ^ "Romeo and Juliet, Box Office Information". The Numbers. Retrieved 29 January 2012. ^ Adler, Renata (9 October 1968). "Movie Review – Romeo and Juliet (1968)". The New York Times. Retrieved 9 March 2012. ^ Ebert, Roger (15 October 1968). "Romeo and Juliet". Chicago Sun Times. Archived from the original on 21 December 2007. Retrieved 9 March 2012. ^ "Romeo and Juliet (1968)". RottenTomatoes.com. Rotten Tomatoes. Retrieved 17 January 2014. ^ "Romeo & Juliet: Nino Rota: Music". Amazon.com. Retrieved 7 March 2012. ^ "Nino Rota Romeo & Juliet Soundtrack HDtracks high resolution audiophile music downloads". HDtracks.com. 4 December 1999. Retrieved 7 March 2012. ^ Bronson, Fred (1992). Billboard's Book Of #1 Hits (3rd ed.). New York, New York: Billboard Publications, Inc. p. 255. ISBN 0-8230-8298-9. Comprehensive webpage on Romeo & Juliet at the Wayback Machine (archive index), featuring magazine articles and film reviews (archived).